The program aims to acquaint trainee teacher to acquire the attitudes..
To appreciate needs of children with special education needs in a classroom. To familiarize the participants with the basic and most important concepts to becoming a helping professional. National Academy, established in the year 1975 is one of the premier training institute and a trusted name in Mumbai & is a division of Uttarakhand Educational Trust. It was established by our founder "Shri. L.P Bhatt" with the objective of imparting quality and career oriented education in the various fields of teaching and designing arena. Today.. Dotted across almost all areas of Mumbai, National Academy is one of the largest Montessori teacher training institutes in India. 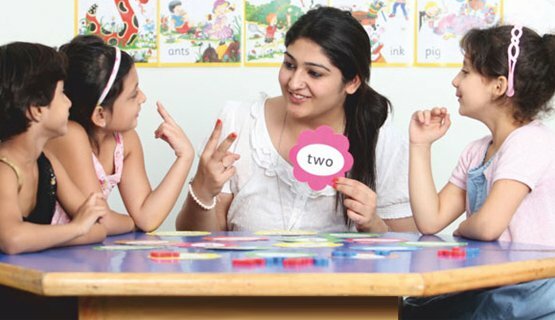 We have been establishing new benchmarks in Montessori teacher training in Mumbai since last 40 years, and have produced thousands of skilled teachers. A teacher is the creator of society. Therefore, we take our duties very seriously while training the teachers that create the societies of next generation. Our Montessori course in Mumbai is highly centered towards preparing the teachers who are not only packed-up with their skills, but have the sense of responsibility and dedication which an occupation like teacher requires. We teach you everything what you will be teaching to your students, plus, we will teach you all those additional skills you require to make a change with what you do. Welcome to National Academy, the most reputed center of Montessori training in Mumbai. Start your career as a teacher with us, and get the eyes rolling with the skills and sensibility we pour in you. National Academy respects the teachers, and National Academy is committed to produce the teachers that make a difference. With Montessori course, we also provide pre-primary teacher training, ECCEd course, course for learning disability, training for psychological counselling as well as courses for jolly phonoics. Its time to give a boost to your teaching career. Enroll for Montessori teacher training today. Just give us a call or fill up a simple contact form. "I did ECCEd course from National Academy & had an awesome experience. The course offered by NA is very comprehensive. They have an excellent team of faculties who guided us at every stage. The study materials is very detailed compiled by experts in the field. I believe the candidates who pass out from the academy are well-versed with the techniques & theory that is needed for this profession."